Hands down the single finest copy of elusive issue we've brokered. When was the last time anyone saw this card centered?! 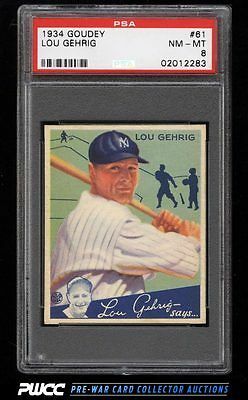 Offered here is a stunning, high grade '34 Gehrig which boasts the best eye appeal of any PSA 8 we've seen offered. This card simply never comes with such wonderful preservation and registration. Clean and sharp throughout with four square corners and great print for the issue. As fine as they come and worthy of an equally fine collection. Part of an absolutely stunning '34 Goudey set break on the auction block this month. This set is the current #1 finest on the PSA set registry and holds some of the premier examples in the hobby. One of over 11,000 cards, lots, and sets up for bid in our 9th Auction of 2016. Click on the link above to view the other PWCC auction lots.